To kick off 2015, we are taking on a big, bold question when it comes to Judaism: Is there a God, and how much does this question matter to today’s Jews? Two-thirds of Jews polled in a 2013 Pew Research Study called “A Portrait of Jewish Americans,” said it is not necessary to believe in God to be Jewish. Given this surprisingly high percentage, we wanted to go further by asking Jewish atheists whether they experience conflict in being Jewish, but not believing in God. After all, there are Jewish leaders who think Judaism without God cannot sustain. 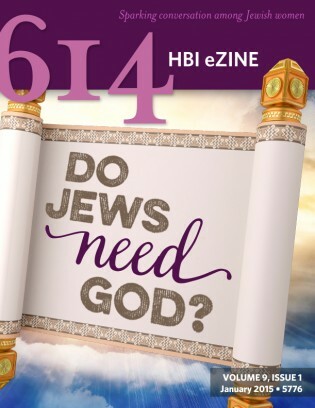 In this issue, you will hear from Jewish authors, a rabbi, and an artist with much to say on the topic, as well as varying beliefs even within their Jewish atheism. What do you think? Highly acclaimed author and poet Marcia Falk wears the label “post-theist” to widen the definition of Jewishness. In our modern society, many who have been born with Jewish DNA seek farther and deeper when it comes to identifying as Jewish. Artist Fran Forman sees the patriarchal language in prayers as symbols of an ancient culture. Whether we believe in God is not a yes or no question; there is a whole scale of answers to explore. Parenting expert Ruth Nemzoff loves how Judaism makes room for disagreement on so many topics, including the belief in God. Thanks for putting together so many thought-provoking ideas. i love finishing a piece of writing with hmmmmm??? Thank you– I LOVED this edition of the HBI eZine.